I’m sure you’ve heard about the collision with a truck that killed cyclist Jenna Morrison on Monday. There will be a memorial ride on Monday and a ghost bike will be placed at the intersection where she was killed. A ghost bike both memorializes the cyclist and serves as a reminder to all of what was almost certainly a needless tragedy. There’s already a different kind of memorial at the site of the collision. 8-28-00 Man 58 Killed here by traffic. 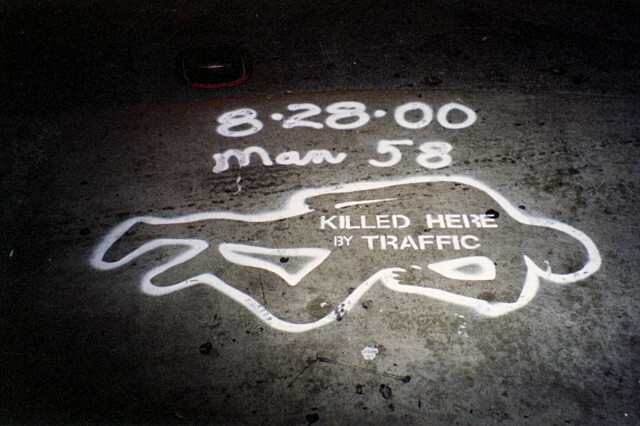 Stencilled with the outline of a body on the street corner where, well, a 58-year-old man was killed by traffic on August 28, 2000. How’s that for direct? When I saw this stencil in San Francisco in September, 2000, you can bet that I paid attention. That I took a picture and knew exactly where to find it in my film archives more than 11 years later should speak to the effectiveness of the blunt message. Here’s a picture of Kelton with his stencil. Although his crusade was specifically about pedestrian deaths, that article says that he was inspired by a similar activist in New York who memorialized cyclists who were killed in traffic. The contrast between a ghost bike and a “killed here by traffic” stencil is notable: a ghost bike abstractly represents mourning, while Kelton’s stencil is a more direct declaration that enough is enough. At some point, cyclists, drivers, pedestrians, and—most importantly—our elected leaders have to stop accepting the status quo and say “enough is enough.” That would require taking the safety needs of all road users seriously. Would having stencils like this dotting city streets cause drivers to be more careful? Maybe not. But it would at least make everyone a little more aware of the human cost of our modern transportation system instead of merely sweeping the statistics under the “it was just an accident” carpet. Now close your eyes and imagine passing five of these on your way to work every day, whatever mode of transportation you choose. Would it change anything that you do?